A superb unbeaten 71 by Toby Bulcock took league leaders Accrington to a third successive win and a first victory at East Lancs since 1993. Bulcock hit five boundaries and two sixes, adding 83 for the 4th wicket with Matt Wilson (43) after Accrington had slumped to 28-3. Graham Lloyd then added 53 with Bulcock before becoming Nas Iqbal's third victim for 33, but Stuart Crabtree helped his fellow left hander finish the job to ensure that Accrington took maximum points for the third time this season and beat East Lancs for the first time in 11 seasons. The home side had earlier made 185 with professional Shanan Stewart top scoring with 64 before becoming David Ormerod's 100th league wicket for Accrington. The visitors skipper went on to take 5-36 with Paul Carroll also picking up 2-25. 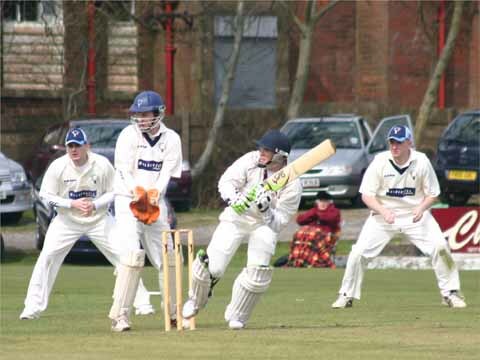 John Turner hit 26, Dave Pearson 22 and Andy Caunce an unbeaten 19 for the home side.